When we visit the children’s room of the library, I gravitate toward the shelf of Caldecott winners: those inventively written and gorgeously illustrated books that I often remember from my own childhood. But ever since he’s had the power to move around independently, my son has toddled elsewhere. I know nothing about children’s book publishing, but there’s a class of children’s books that seems to be a cut below the rest. Cheaply produced, they’re often franchises of classic series like Clifford or Curious George or Thomas the Tank Engine—not the ones written by the original authors, but spun off endlessly by others. The storylines often make no sense whatsoever, and in cases where TV shows are involved, the illustrations seem to be screenshots hastily lifted from the shows: dark, dingy, blurry. 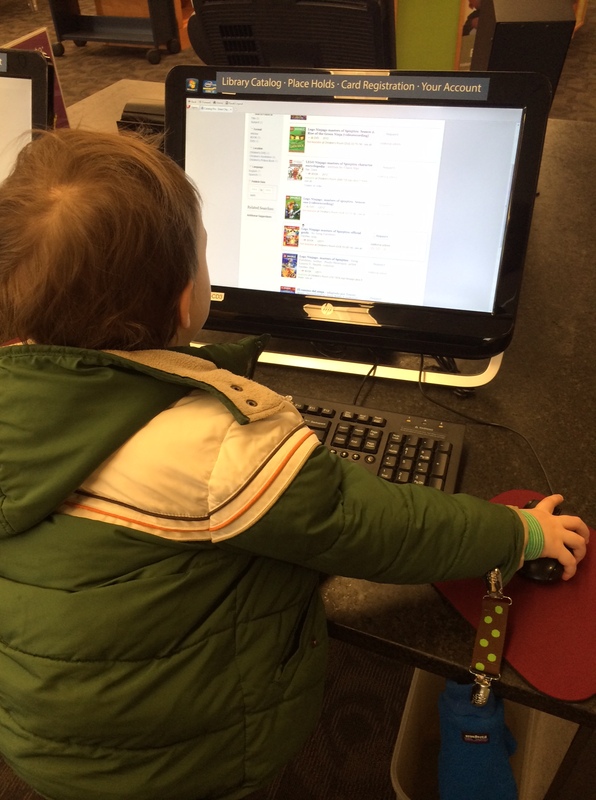 Looking up Ninjago books at the library. Lately his favorite is the Ninjago series. You know, Lego + ninja = Ninjago. Almost everything about these books puts me off. They feature four white male protagonists (there’s a sister, Nya, who seems like an afterthought) and in my opinion they glorify violence and warfare while co-opting Asian culture. And they’re Legos: apart from how goofy it is to be following the adventures of these square-footed people with tubular hands and yellow faces, it’s brought on an insatiable desire for the expensive little toys, which are so painful when you step on them around the house. Product-placement genius. And yet, Buddy can’t get enough of Ninjago. We have all of them checked out of the library, ran out of new ones in English to read, and found one in Spanish, which I poorly translate on the fly while reading it aloud to him (making up plot points when my dusty Spanish doesn’t suffice). But in the back of my mind I know that this is all good, that children need to develop independent tastes, and that disdaining parentally approved culture is the job of kids everywhere. Still, I’m not excited to be reading Pirates Vs. Ninja at bedtime tonight AGAIN. What are your least favorite children’s books?